You have to consider it one of life’s little bonuses when you discover that something you love and enjoy is not only a pleasure, but is also something that is good for you. For those who look forward to that morning cup of coffee or a much-welcomed coffee break anytime of day, there’s some good news to report concerning the benefits of coffee. Research shows that people who drink coffee have a reduced risk of developing dementia, type 2 diabetes and Parkinson’s disease. They also have a reduced risk of strokes. While you enjoy coffee, either in liquid form or by making chocolate espresso beans one of your pleasurable snacks, you can be protecting yourself against cognitive decline and boosting your short-term memory. When consumed in moderation, coffee can be beneficial to your heart health by protecting against heart failure. It has been shown that coffee can lower the risk of multiple sclerosis and protect against cirrhosis. Studies show that coffee can reduce the risk of colon, lung, breast, rectal and liver cancer. Coffee can boosts energy levels and stimulant metabolism. Research also indicates that coffee can reduce the risk of depression. According to some reports, many people acquire the biggest portion of their daily antioxidant values from coffee. Due to their high antioxidant benefit, coffee is considered by some to be one of the healthiest beverages available. There have been some studies done that show that coffee drinkers live longer. Longevity, combined with a boost in energy and brain power, are fantastic reasons to not only start your day with a cup of coffee, but to buy treats such as chocolate covered espresso beans to enjoy as a decadent treat or afternoon pick-me-up snack. With all of the bonus perks they provide, it’s not surprising that chocolate covered coffee beans are becoming a very popular snack choice. Chocolate espresso beans are unapologetically delectably decadent. Chocolate coated coffee beans are a portable treat that you can enjoy at times when a cup of coffee is not an option. Aromatic coffee beans are taken to new culinary heights when they receive a luscious coating of milk chocolate or when they are enhanced by the intense flavor of dark chocolate. You can stash chocolate coffee beans in your desk drawer, lunch box or in your secret hiding place for special treats so that you’ll have them handy for those times when you need a boost of physical or mental energy or for those moments when your sweet tooth begs for something beyond the basic candy bar. If you want to impress guests at your next party, just make chocolate covered coffee beans one of the snack choices on the party table. Be sure to make chocolate covered coffee beans bulk buys before the party. The bowl that contains these exquisite little chocolate espresso beans is sure to be one of the most popular gathering places for your party guest. When you buy chocolate covered coffee beans, the amount of caffeine in those beans varies in accordance with the size of the bean. Another factor involved in the measurement of caffeine content in chocolate coffee beans is how dark the beans were roasted. There is an estimated 2 to 6 mg of caffeine per roasted coffee bean. An additional 1mg of caffeine is added when the roasted beans are transformed into delicious chocolate covered coffee beans. That measurement could vary slightly depending on the thickness of the chocolate coating and the type of chocolate used. For the purpose of comparison, the caffeine content of brewed coffee can range from 70mg to 140mg of caffeine depending on the strength of the brew. On average, an 8 ounce cup of brewed coffee contains approximately 95mg of caffeine. A one shot espresso contains about 63mg of caffeine. Most people are not adversely affected by consuming 400mg to 600 mg of caffeine daily. However, it is important to note that some people are more sensitive to caffeine and should adjust the amount of coffee and specialty treats, such as chocolate covered coffee beans, they consume according to their tolerance level. Chocolate coffee beans continue gaining popularity as a decadent treat and as an energizing snack for those who love a deep, rich coffee flavored treat with an immensely satisfying sweetness as an extra bonus. This is one treat that you should enjoy in moderation if you are carefully monitoring your calories. There’s an estimated 86 calories in 10 chocolate covered espresso beans. There will be some variation in the calorie content depending on the type of coating the beans have, Espresso beans coated in milk chocolate have 180 calories per 30g serving while those covered in dark chocolate have 160 calories for that same size serving. Just as people have different preferences as to how strong they want their coffee, they have varying taste in what type of chocolate coating they prefer on their roasted coffee beans. A milk chocolate coating provides a soothing, mellow flavor that might well be preferred by those who like their coffee brewed within the mild to moderate range. 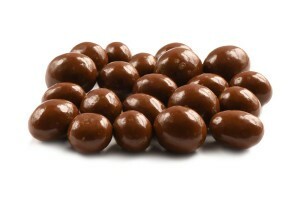 Milk chocolate covered coffee beans are a good choice for those who newcomers to this delicious, habit-forming treat. The same distinctive, intense and slightly bitter flavor that sets dark chocolate candy apart from the milder flavored milk chocolate candy is what attracts some people to coffee beans covered in dark chocolate. These beans are rich, decadent and bold. They have the intensity that espresso lovers desire and the uniquely sweet undertones that dark chocolate is revered for. They’re a treat that will earn your respect and can quickly become an addictive obsession that will have you making chocolate espresso beans wholesale purchases just to be sure that you don’t run out.